Holiday Gift Guide #1 - SweetTartStyles. So with Christmas coming up, and December right around the corner, it's time to jump on the ball of gift giving and deciding just WHAT are you going to get everyone on your list! 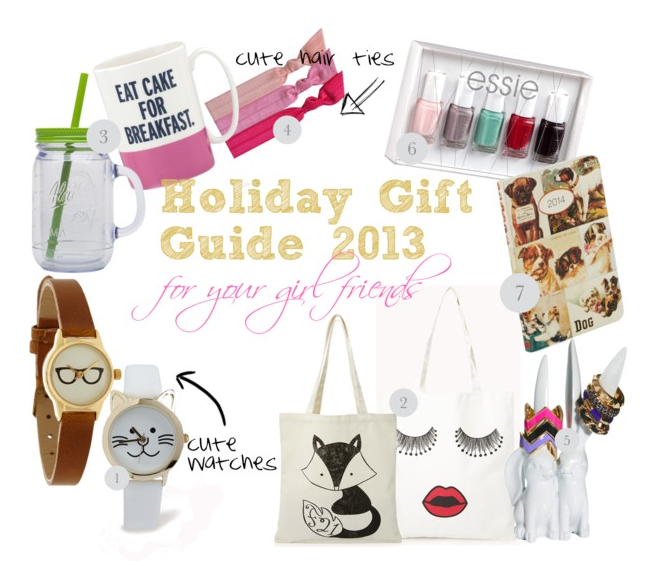 I love giving gifts, so I decided putting together a little collage of what would be cute to get your closest girlies! 1.) How cute are these watches from Forever 21, both simple but chic and for a sweet price of only $17! Hello! 2.) For that book loving friend or someone who goes to school, these totes are the cutest to carry around your essentials. The cute designs make them perfect for any setting whether it be school, to the bookstore, to work, or just to carry from day to day! Both from Forever 21 and both only $3.80! 3.) It's always good to stay hydrated! So why not keep your water in a cute mason jar tumbler, available pretty much anywhere now a days, but this one specifically is from Target, for $9! Not only for cold beverages but also for anyone who loves their morning brew, a cute coffee mug always makes me happy & pretty much any other coffee drinker, Target has adorable ones in plenty of designs & colors, but this cutie pictures above is Kate Spade for $20. 4.) Us girls are ALWAYS needing hair ties, so why not get your best friend these cute hair ties, but a little ribbon at the end, available everywhere, in a variety of colors, designs, and patterns. These above are from Nordstrom for $6.50. 5.) For that girl friend who has plenty of rings, why not get her a ring holder, how cute are these little bunnies from ASOS for $14, also Target has some too, they are a cute gift. 6.) Every girl can not ever have enough nail polish, so why not get her a little more. Essie is a really good brand and this gift set is available at Target for $15. 7.) Any of your friends a dog lover? I know I am, and I would love to receive a planner with cute pups all over it! This one from Modcloth for $15. Love it. Hope y'all enjoyed, keep up for more guides to come.